The Roadster Dash | Just Shooting Memories! I was looking through my classic car posts and noticed that I have not posted any shots of the interior of these fine cars. I was very surprised to find this out since I have plenty. There is so much detail and attention paid to everything on these cars. From the body to the engine, nothing is overlooked. If it appears as if the car is not finished, all you have to do is ask the owner and they will be happy to tell you what the next step is to getting their car in better shape. One of my favorite places to look on a classic car is the dashboard. Outside of the factory re-make / restored, there are no two alike. 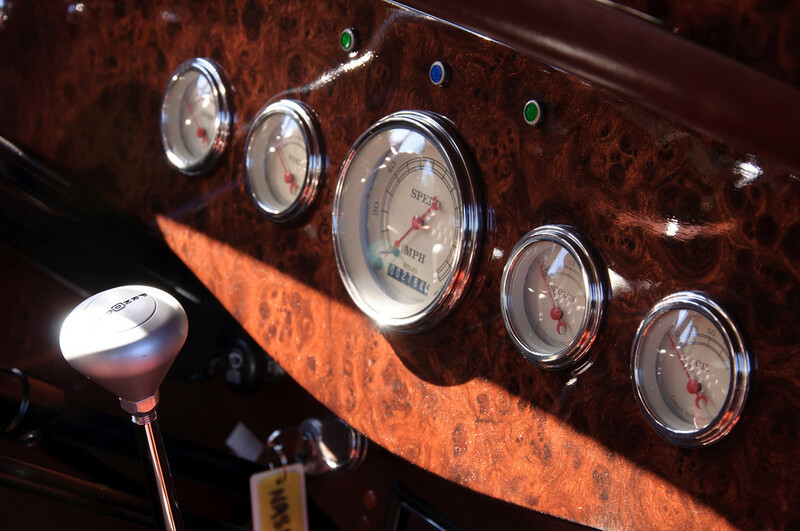 Between the dash itself and all the different gauges and dials, there is an endless combination. It is almost as painful waiting for the regular car season to roll back around as it is to wait for football to come back. Now I just need to find something to fill the time between. Very classic shot. The woodgrain and chrome really pop. Can’t wait to see more. Tim, they are coming. I could not believe it when I noticed I had not posted any. I made the mistake of looking at several of your photos during work morning and can’t stop! Love all of your photos – Beautiful and at times fascinating. Thanks so much for sharing your talents. I’ll be back to visit again. Cherrell, Thank you for stopping by. I am glad you like the photos. Hopefully I did not get you in too much trouble at work.